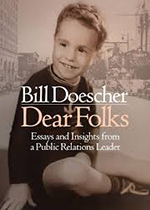 The initial description of Bill Doescher’s “Dear Folks” would be that the book tells the story of both Doescher’s personal life and of his long, distinguished career in the PR industry. But as readers of the book will discover, “Dear Folks” doesn’t tell two stories, it tells one. From his childhood in Utica, NY to his post-PR days selling real estate in Scarsdale, there is a clear line connecting the man who was senior vice president and chief communications officer at Dun & Bradstreet (as well as president of the PRSA Foundation and PRSA-NY) with the teenage boy whose main goal in life was to make his Aunt Elsie proud of him. The book’s title comes from the opening of the weekly letters that Doescher’s father and grandfather would write to family members. Just as those letters passed on what his father and grandfather had learned, so do the more than 40 short essays in “Dear Folks” distill Doescher’s view of what it takes to succeed in business and life. Real integrity may well be the overriding theme of Doescher’s book. Whether he is talking about mentoring, the rules for achieving success in public relations or the reasons why golf really is a metaphor for life, one theme emerges again and again—the need to figure out what’s important to you and then staying true to your beliefs. Mixed in with the life lessons, however, are some sharp insights about what it takes to move ahead in the corporate world. One Doescher Lesson, at the end of a chapter entitled “Where is PR Headed?,” gives a quick checklist of 12 basic principles that positively influenced his career. Professionals starting out in the business world could do far worse than to take that page and post it above their desks. “Dear Folks” has its roots in the good old days of the business, but it also has an original take on PR’s present and its future. The last chapter, “The Next 20 Years,” looks at the success of Amazon and the development of Artificial Intelligence. While Doescher welcomes the new technology, he also expresses the hope that we don’t lose our values along the way. In a move that brings the vivid stories of his childhood together with the present, he gives a nod to the 2018 documentary “Won’t You Be My Neighbor?,” and says the world could use a new version of the film's subject, Fred Rogers. “Dear Folks” is available from PRMuseum Press.